The most commonly known aerospace data recorders are flight data recorders and cockpit voice recorders. Majorly fuelling the global aerospace data recorders market is the pressing need for real-time data transmission during flight. The data transferred to and from cockpit and aircraft serve a crucial purpose in investigations. On account of this, they are being increasingly incorporated in commercial as well as military aircrafts. Acting as a restraint to the global aerospace data recorder market is the expensiveness of next generation flight recorders. A growing aerospace industry worldwide is stoking demand for cutting-edge technologies to amass accurate and precise data from an aircraft. In response to that, aerospace data recorder manufacturers are developing technologies using sophisticated and expensive electronics and sensors, which in turn is upping the price of the final product, thereby crimping their demand to an extent. To overcome such challenges, savvy players in the global aerospace data recorder market are emphasizing on research for the transmission of real-time data directly to cloud. A report by Transparency Market Research projects the global aerospace data recorder market to expand at a lackluster CAGR of 4.6% from 2017 to 2025. At this pace, the market will likely attain a value of US$2.086 mn by 2025 from US$1.422 million in 2016. Component-wise, the global aerospace data recorder market can be divided into flight data recorder, cockpit voice recorder, quick access recorder, and data recorder. The flight data recorder, among them, leads the market and it contributed significantly to the market share in 2016. In the years ahead, the segment is expected to expand further. Vis-à-vis growth rate, the cockpit voice recorder is slated to outpace all other components in the aerospace data recorder market in the next couple of years. From a geographical standpoint, North America is a leading market for aerospace data recorders that holds maximum share. Bolstering the market in the region is the growth of commercial airlines and swift expansion of air traffic, particularly in the last few years. This has also driven up demand for flight recorders. Further, the U.S is also funneling considerable amounts in modernization of conventional systems embedded in defense aircrafts. This has resulted in manufacturers developing robust technologies to meet the demand of the U.S Department of Defense. Europe trails North America in terms of market share and is also expected to grow at a swift pace in the upcoming years. The region’s growth is mainly stoked by the ongoing modernization of commercial aircrafts and defense aircrafts which are resulting in investment in improved technologies. For example, aerospace data recorders manufacturers in Europe have developed a lightweight composite data recorder, capable of withstanding heat from intense fire and high speed impact. This has visibly impacted the aerospace data recorder market positively in Europe. In terms of growth rate, Asia Pacific is slated to surpass all other regions in the global aerospace data recorder market mainly on the back of surging air traffic in the countries of India, China, Japan, Australia, and South Korea. China and Japan together generated over half of the revenue in the region in 2016, while, India is expected to emerge as the most attractive market in the foreseeable future. The top ten companies in the global aerospace data recorder market are Honeywell International Inc., AstroNova Inc., Teledyne Technologies Inc., Curtiss-Wright Defense Solutions, FLYHT Aerospace Solutions Ltd., L-3 Technologies Inc., SLN Technologies, RUAG Group, Leonardo DRS, and Universal Avionics Systems Corporation. The global market for aerospace data recorder is primarily driven by the pressing need for real-time information exchange during flight. The data transmission between the cockpit and aircraft is crucial to prevent safety glitches and for investigational purpose in the event of an untoward incident. This accounts for the increasing deployment of aerospace data recorder in commercial as well as military aircrafts. The report on the global aerospace data recorder market is appropriately segmented on the basis of component and geography. 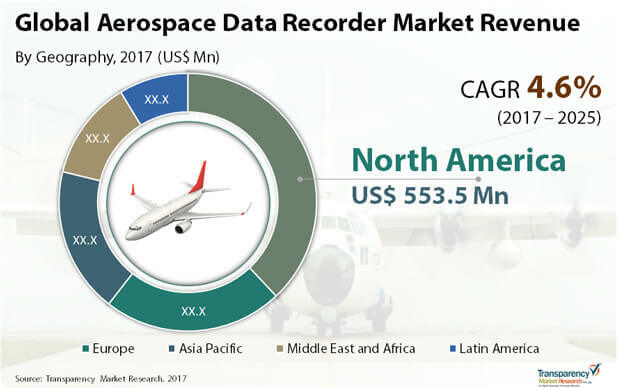 The cockpit voice recorder is anticipated to rise at a healthy clip and surpass other key component segments in the aerospace data recorder market over the forecast period. The report prepared by seasoned analysts provides a distinctive evaluation of the aerospace data recorder market taking into consideration growth drivers, challenges, opportunities, competitive landscape, and other important aspects. Boosting the growth of the global aerospace data recorder market is the pressing need for real-time information exchange during flight. Aerospace data recorders aka flight recorders are electronic devices that are mostly used to carry out investigations of aircrafts. Cockpit voice recorders and flight data recorders are the most common aerospace data recorders. The data transmitted between the cockpit and aircraft is crucial during an investigation, and due to this, real-time data transmission systems are being deployed in commercial as well as military aircrafts. The demand to serve the aerospace industry is driving the growth of aerospace data recorder market. One of the key growth challenges to the aerospace data recorder market is the high price factor of next-gen flight recorders. With the exponential growth of the aerospace industry globally, aircraft component manufacturers are leveraging cutting-edge technologies to gather accurate information from an aircraft. Manufacturers of aerospace data recorders are employing sophisticated electronics and sensors, which in turn is upping the price of the final product. This is negatively impacting the demand for aerospace data recorders to some extent. The worldwide market for aerospace data recorder currently witnesses the supremacy of North America holding the leading market share. Serving to boost the growth of North America aerospace data recorder market is proliferation of commercial airlines and rising volume of air traffic in the past couple of years. This has necessitated deployment of modern equipment that helps in investigation in the event of an untoward eventuality. The U.S. is pumping in vast amounts of money for the modernization of conventional systems deployed in defense aircrafts. Manufacturers are thus developing robust technologies to serve the demand of the Department of Defense in the U.S.
Europe is the second-leading market for aerospace data recorders and could secure its position over the forecast period. The proliferation of commercial flights and efforts for the modernization of commercial and defense aircrafts are key factors behind the growth of Europe aerospace data recorders market. Asia Pacific is anticipated to emerge as a lucrative market for aerospace data recorders owing to the rising volume of air traffic in countries such as China and India. The global aerospace data recorder market includes key companies such as Honeywell International Inc., Teledyne Technologies Inc., FLYHT Aerospace Solutions Ltd., SLN Technologies, Leonardo DRS, Curtiss-Wright Defense Solutions, AstroNova Inc., L-3 Technologies Inc., Universal Avionics Systems Corporation, and RUAG Group.